Using debt to get by when you’re unemployed might make sense if you’re only out of work for a few weeks, but what if it’s longer? Debt can build up very quickly when you don’t have an income (or just an unemployment benefit check), so it’s best to have alternatives so you don’t get too deep in. Here are five ways to avoid debt when you’re unemployed. One of the worst debt mistakes newly unemployed people make is assuming they’ll get a job right away. As a result of that assumption, they often continue with the same spending patterns they had when they were fully employed. No matter how optimistic you are about getting a new job, it’s best to be pessimistic about your expenses. Start cutting back immediately, even if that means the elimination of your job has been announced but hasn’t actually happened yet. Start by cutting optional expenses, like eating out, recreational shopping and entertainment. Be ready to cut out cable TV, landline telephone service and any other service you can do with out. If you have to go into debt as a result of being unemployed, make sure you aren’t doing it early in the game. If you’re unemployed for a few months, or a year or more, you could be deep in debt as a result of borrowing and spending earlier. 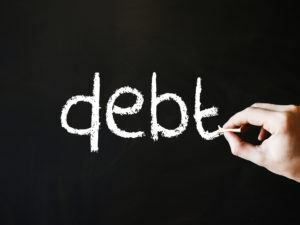 At that point, your new debt payments will make your cost of living even higher and at a time when there are fewer options. Cash is king in a crisis, and a job loss is a crisis. By selling any unused or unnecessary items you have, you will be raising cash. Doing this early will improve your cash flow up front. You can sell your goods with a garage sale, through eBay, Amazon or Craigslist, or through consignment stores. Most people wait to get charitable help until they’re desperate, but one of the chores you’ll have in being unemployed is to make sure you don’t reach the point of desperation. If it’s hard to look for a job when you’re feeling optimistic, it will be much worse when you’re feeling hopeless about your finances. There are churches and public charities that help people in need, and if you rely on your paycheck (rather than a fat bank account or investment portfolio) for survival, you will be one of the people in need. This isn’t something you should abuse, but if your budget is tightly stretched, and your car needs a $1,500 repair, it’s better to get help from a charity in paying for it than letting your house payment go. If your time of unemployment starts turning from weeks into months, you should have a plan for cutting your big expenses. That can include your car and even your house. You may have to consider finding a way to lower those expenses or even downsizing. For a car, you might have to downsize to a less expensive car, preferably one that doesn’t have a monthly payment. It’s not as easy to trade down on a house, but if you rent, you can consider taking in a roommate, since moving to a cheaper place won’t be easy if you’re unemployed. If you own your home, you might be able to take in a boarder for as long as it takes you to find suitable employment. If you live in the U.S. and you have student loans to pay, you may be able to get a payment reduction under the Income Based Repayment Plan, or IBR. Since lowering big expenses generally takes longer than smaller ones, start moving on them as soon as it seems apparent that your jobless time will be longer than short term. In today’s economy it isn’t at all unusual that the unemployed aren’t able to find suitable employment in their chosen field. When that happens, it’s time to look into alternate career fields. This is another of those efforts that could take a very long time to accomplish, so if you see the potential for this to happen to you, it might be best to at least start investigating the alternatives as soon as possible. It may even be that you’ll have to consider two or three income sources to replace the one you just lost, and that will take time to develop as well. Don’t wait until your unemployment benefits run out before starting this. You want to make sure that you’ll have an income when the government checks stop coming in. The alternative will be to rely on credit to pay the bills, and when you do that the balances go up incredibly fast. Always remember that any debt you incur while unemployed—as much as it may be needed—will have to be repaid when you go back to work. That will slow your financial progress for a long time. For that reason, keep debt use to a minimum, looking for as many other sources of income, savings or cash possible.